Home / Beer Pong Rules / The biggest rule revisions in the history of The World Series of Beer Pong® are here! 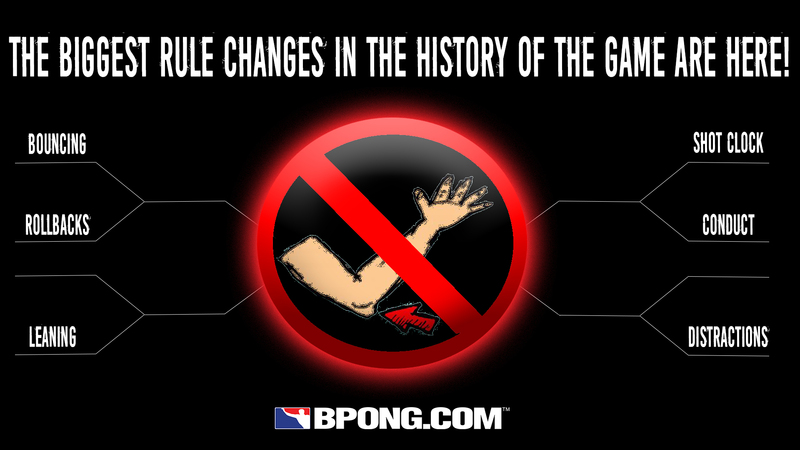 The biggest rule revisions in the history of The World Series of Beer Pong® are here! When we first launched BPONG.COM™ in 2001, we never wanted to define the game of beer pong. Our goal was, and remains, to unite all beer pong players of the world by creating a platform through which the fans and players of the game could associate and help grow the game. As such, we never listed any official rules on our website. Of course, when we created The World Series of Beer Pong five years later, with bigtime money at stake, we were forced to create official rules governing tournament play. We did seriously entertain the idea of creating several different diverse sets of rules and randomly selecting a different rule set governing every new round of games at The WSOBP®, but we realized that was not the best approach. We literally spent over 100 hours trying to come up with the perfect set of rules not for all games of beer pong but for our specific tournament. These rules were not influenced by how we personally played the game. Instead, they were influenced by factors such as trying to run an efficient tournament, ensuring the people that traveled from all over the world would actually get a chance to play, and minimizing disputes. By no means were the rules perfect; perfection will likely never exist. Nonetheless, the Official Rules of The World Series of Beer Pong have become the primary set of beer pong rules governing play for the largest and most serious beer pong tournaments in the world. As the prize payouts have grown over the years and the level of competition has increased, beer pong teams and players have exploited the official beer pong rules to the max, finding new ways to gain perceived advantages we never contemplated in a rule set that we felt was fairly black and white. It is now time for some changes, changes that are long past due. But let’s be clear: these changes are not inspired by any specific beer pong teams or players. Many of these changes were contemplated and almost made over 5 years ago, e.g., after WSOBP V or VI. Below is a summary of the more notable official beer pong rule changes, but of course, you should also review the revised Official Beer Pong Tournament Rules for The World Series of Beer Pong. The first major change is probably the most significant since it will have the greatest impact on how players will shoot the ball: changes will limit the amount of leaning in the game. But first, let’s look back at why we even allow leaning at The WSOBP. When we announced the first WSOBP would take place in January of 2006, rules were much different. It was 2005, and leaning was just as common in the game as an elbow rule was at house parties - it just depended on which house party you were at and which rules the house was using on a given night. The general public primarily played the game in one of two ways: (1) leaning is allowed; or (2) some type of no lean rule, such as an elbow rule, fingertip rule, or wrist rule. If all things were equal, we could have flipped a coin, but all things are not equal between the two options. Namely, option 2 (no-lean) opens up the possibility of more disputes over crossing a somewhat imaginary plane (i.e., the end of the table), while option 1 (leaning) removed this potential dispute. And remember, there is a huge difference between playing beer pong amongst a group of your friends at your own house compared to playing against hundreds of people you do not know for tens of thousands of dollars. Disputes will happen with any set of rules, but we wanted to attempt to minimize these potential disputes as much as possible. Original WSOBP rules required shooters to shoot with both feet on the ground. We removed this restriction when a player approached us at WSOBP IV or V and demonstrated how his partner shot on one foot. The shooter was perfectly vertical and was not on one foot to gain an advantage; he just felt balancing on one foot helped him focus on lining up his shot. We never envisioned how skilled players would become at balancing on one foot to gain an exaggerated lean! It never crossed our minds they would even try! Yet some of the players have become so good at this technique, they’d rival a hot yoga girl (or guy) holding a Warrior 3 pose. While we admire this skill beer pong players have acquired, it looks ridiculous, especially as we are trying to grow the game by appealing to the masses, many of which do not generally allow leaning in any form these days. We will consider holding a yoga contest if we receive enough interest from beer pong players wanting to continue perfecting their yoga skills. Players must start their shots with both feet on the ground. Players may lift a foot only as part of a continuous motion once the player has started a forward-throwing motion of his/her shot. Players may not touch the table at all after a shot is released. This change will not only eliminate players “falling onto the tables,” they may not touch the table at all to regain balance. Players may not substantially move a table from its original position when shooting (or after a shot as part of a follow-through motion). At WSOBP I, we allowed no rollbacks! It sucked! The theory was we knew teams would be coming from all over the place, and we wanted to ensure players actually got a chance to play the game. With the more common “endless rollbacks,” we feared a team could run the table without even giving a team a chance to shoot. We did not feel it was fair for a player to lose having barely shot when players paid good money and traveled from afar. But rollbacks are fun. When rollbacks are in play, the second shooter always feels “that extra feeling” after the first shooter already hit a cup. The solution was the “Pope’s Rule,” named after Dustin Pope, who suggested the 1-ball-rollback compromise. When the playing field was more level in earlier years, players on a team more frequently shared the rollback shot. In more recent times, however, it is more and more common for only one player on a team to take all the rollback shots. We always viewed beer pong as a team sport, and as such, we want all players on a team to contribute to that team’s success or failures. Read the full text of The Pope’s Rule. The WSOBP has always allowed bounce shots but only counted them as the 1 cup they hit. Defensive players have not been permitted to swat bounce shots. In contrast, the general population more often plays by allowing bounce shots to count as 2 cups, but defensive players are permitted to swat the shot. This adds an extra element of strategy to the game, e.g., defensive players must always pay attention, and offensive players can try to catch the defense off guard by taking a risk with a bounce shot. Respect for the Past. We were inspired by our early years at a house party at the “soccer house” at which “some old guys” (i.e., alumni) shot every single shot by bouncing and insisted we not swat. We of course relentlessly made fun of them, but they insisted, “This is how we played 10+ years ago, so we want to play how we used to play.” Who were we to tell them they were wrong, especially when they played a decade or more before us? Allowing bounce shots paid respect to those old guys, whom of course we never saw after that one night. Balls Everywhere! We were concerned swatting balls would send balls everywhere and interfere with neighboring games at a large scale tournament. Why not? Adding an extra layer of strategy should be fun. Furthermore, having run more than a few WSOBP events (and others), we’re less concerned about the “balls everywhere” problem. And as for “paying respect to the past,” we did include an exception that allows a player to bounce without swatting by declaring at the beginning of the game s/he will bounce every shot. Bounce shots now generally count as 2 cups, and defensive players can swat bounce shots. Read the full rules related to Bouncing Shots. Distractions are fun, but they need to have some limits. Players should be able to fairly shoot the ball. Common sense is not always so common, and again, players continue to push boundaries (and go past them). The rules relating to distractions have simply been clarified. For example, some have questioned whether props are permitted. Of course they are! Props are fun! One of our favorite distractions of all time came from WSOBP I and involved props, namely a hotdog and hotdog bun, with which the player used a hotdog bun to, uh . . . pleasure a hotdog. So now it’s clear: props are permitted, although don’t be stupid, respect all rules/laws, and organizers and venues have final say on what may or may not be permitted. Read the full text related to Distractions. Running beer pong tournaments requires balancing many factors - time, space, fair competition, staffing, and more. Running The WSOBP requires even more resources, costing hundreds of dollars per hour. At the same time, shooting should be simple. Obtain a beer pong ball, line up your shot, attempt to shoot the ball into a cup. Somehow, players began making this simple process a complex one that would often take minutes. This was great for all the staff getting paid overtime to keep the event running; this was not great for other players’ enjoyment of the game or our budgets. The game has stationary cups that are located in the same place every single time you play. You have no physical obstacles to get through before having a clean look at whatever cup you are shooting at. Players should not be taking minutes to shoot a single shot. At WSOBP VIII, we instituted the concept of a shot clock, giving players 30 seconds each to shoot each shot. We aren’t changing much, but upon further consideration, 30 seconds is still a ridiculous amount of time for a shot, and furthermore, because of how the shot clocks operated, we usually implemented the shot clock by giving a team a total of 60 seconds to shoot both shots. Players also sometimes argued that our rules stated a referee, in his/her sole discretion, could implement a shot clock, and it was therefore unfair for a referee to implement a shot clock, in his/her sole discretion, after the opposing team complained to the ref that a player was taking too long to shoot. Stupid? Yes. But we’ll hopefully help fix that. The revised rules clarify that a time limit on shooting may go into play if all players agree, if a referee imposes a time limit on shooting, or if a referee imposes a time limit on shooting after a request from a player. We also revised the time limit. If a time limit on shooting is imposed, each team will have 45 seconds to shoot both shots. The team will have 15 seconds to shoot any rollback shots. Read the full rules relating to Time Limit on Shooting. While our goal was never to define the official rules of the game, the competitive beer pong community and associated events we’ve built requires us to do so. As the game evolves and rules get interpreted in new ways, the rules need to be reviewed and updated on a more regular basis. They have not been updated in years, until now. These updated beer pong rules may still be tweaked over the coming months for clarity, but we expect no additional major changes until after WSOBP XIII. Whether you choose to utilize our official beer pong tournament rules as your personal “house rules” or not, we encourage you to get out and play! Who knows - you could be the next World Series of Beer Pong Champion! Oh, and one last little thing - don't be surprised to see an official code of conduct, including penalties, creating itself sometime before WSOBP XIII.